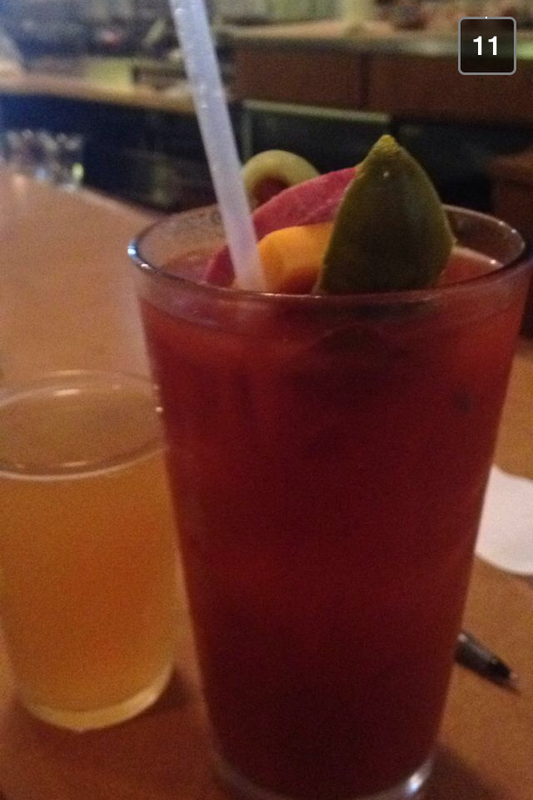 This weekend, we stopped at Walters’ on North to sample their Bloody Mary. We’ve been here before, but have never reviewed this drink. When ordering, we were asked if we wanted it spicy, medium or mild. I chose medium…but I’d hate to see what spicy tastes like. I could barely finish a quarter of my drink–the horseradish and hot sauce were so potent. Mix:Homemade-you could definitely taste the horseradish and hot sauce! I must admit, I was not a fan of this drink. And, although the people here are friendly and there is definitely that neighborhood pub vibe, I’m also not a fan of the interior of this bar. With carpeting on the floors and that lingering smoke smell from over from 2010 when the smoking ban went into effect, I feel more like I’m in someone’s basement than a pub where I’d like to spend a lot of time. Compared to the other bars on North Avenue, Walters is very dated and in need of renovation. I felt the same way about Shepherd’s before it became Red Dot and now that’s one of my favorite places to go.